Update: Welcome Facebook users! If you like this content, please be sure to “Like” and “Share” this post to help me spread the word about the Siege of Petersburg. Also, be sure to sign up for email updates from the Siege of Petersburg Online. If you like this post, be sure to also check out more 150th anniversary posts on the Siege of Petersburg. In the early morning hours of January 24, 1865, 150 years ago today, a drama was playing out on the James River at Trent’s Reach between the Confederate James River Squadron and the Union Fifth Division, North Atlantic Blockading Squadron. On the evening of January 23, Flag Officer John Mitchell’s Confederates set off from Chaffin’s Bluff with an audacious plan to break through the Union obstructions blocking the James River channel at Trent’s Reach and destroy Ulysses S. Grant’s all-important supply depot at City Point. As I discussed yesterday, City Point was the key to the Federal chokehold on Petersburg and Richmond. Supplies came up the James by water to City Point, and were then loaded onto wagons, mules, and railroad cars to be sent to the soldiers at the front. If City Point could be reached and destroyed by the Confederate ironclads, the Confederates reasoned, Grant would be forced to at least temporarily consolidate his position and release a bit of the iron grip he currently held. City Point, then, was the goal. But when we left the scene yesterday, the Confederates were still at the Union obstructions barring the way downriver from Trent’s Reach. 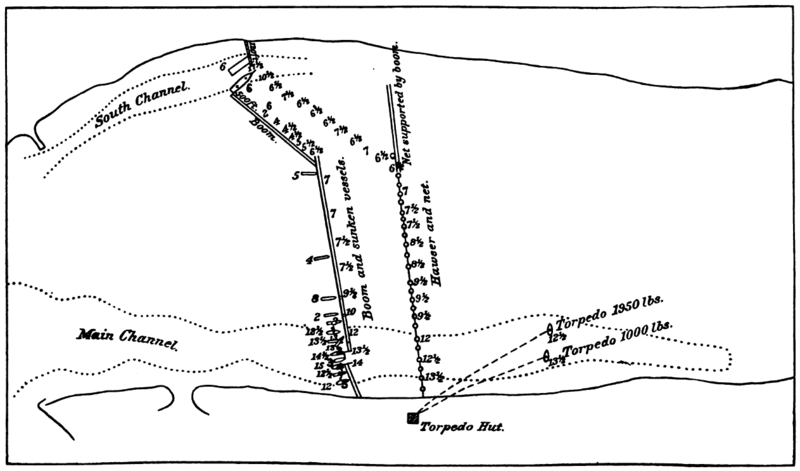 While most of the Confederate vessels anchored about a half mile west of the obstructions, Flag Officer Mitchell took the Fredericksburg and Scorpion close by the blockage to determine if the heavy ironclads could work their way through. While Mitchell surveyed the scene, a Union picket boat saw what was happening and gave the alarm. 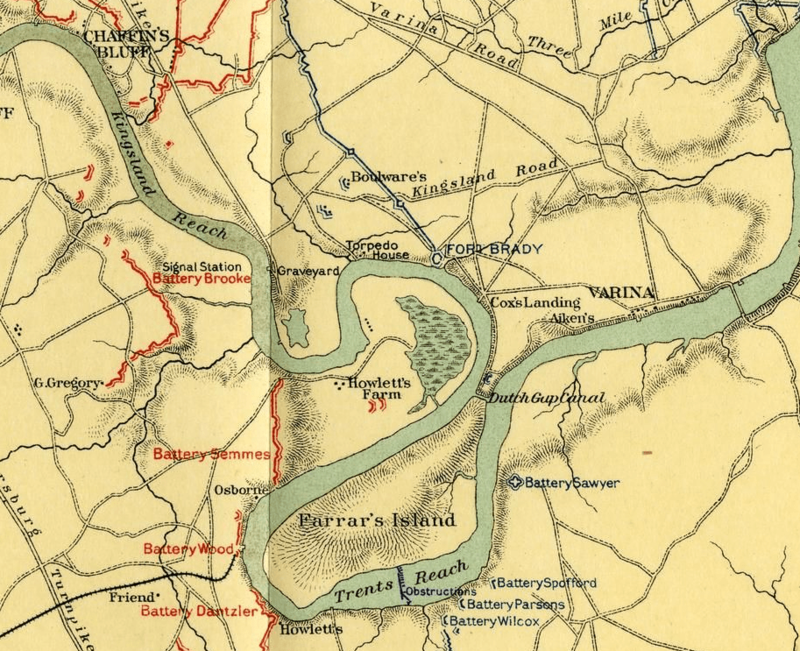 The four Union batteries guarding the James River, Wilcox, Sawyer, Spofford, and Parsons, opened up in the darkness, hoping to hit something down on the surface near the obstructions. Through the ineffective Federal fire, Mitchell discovered that several hulks which formed the backbone of the river barrier had shifted due to the recent freshets, allowing enough room for an attempt to pass. Mitchell ordered the Fredericksburg, the lightest of his three ironclads, to test the feasibility of a run by the entire squadron. Lieutenant Shepperd, in command of the Fredericksburg, ordered his ship through. Despite losing the torpedo spars attached to her sides and striking something heavily underwater, the Fredericksburg successfully made it through at 1 a.m. on January 24. The gunboat Hampton accompanied the larger ship to within a football field’s length from the eastern end of Dutch Gap Canal. These vanguards then anchored and waited patiently for Flag Officer Mitchell to head back upriver and shepherd the rest of his boats through the tricky obstructions. There was no guarantee of success for the larger ironclads, both of which had a deeper draft than Fredericksburg. When Mitchell made it back to the middle of Trent’s Reach around 1:45 a.m., however, he found a disaster. His flagship and most powerful ironclad, the Virginia II, had become grounded around midnight, and the gunboats Nansemond and Beaufort spent hours trying to help get her free. 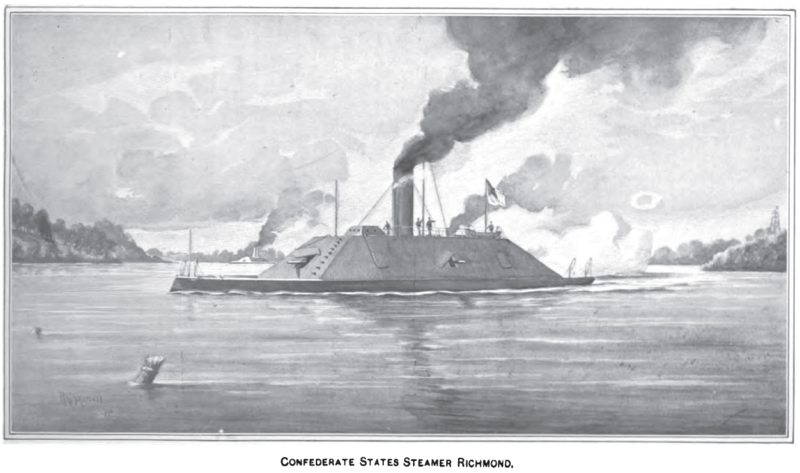 To make matters worse, the third ironclad Richmond and the gunboat Drewry had also run aground in the river, with Scorpion later meeting the same fate on the pitch black river. Running aground by itself could be a disaster for any naval ship. In this case, matters were much worse. If Mitchell could not get his ships freed by morning, the four Federal fortifications in the vicinity would have his ships as stationary targets at fairly reasonable ranges. They would be sitting ducks. And this didn’t even take into account the potential danger from a sortie by the powerful two-turreted monitor Onondaga. The Confederates might be able to sink her with a torpedo spar if they presented many moving targets, but sitting motionless, they were no match for Onondaga either offensively or defensively. Mitchell recalled the Fredericksburg and Hampton back through the barrier, hoping to try this again another night. But he still had a massive job to do with massive ramifications if he failed. He pulled back all of the ships which could still move to the protective guns of Battery Dantzler. Then the Confederates worked all night to free their many grounded ships in Trent’s Reach. By morning, despite heroic efforts, the gunboat Drewry and the ironclads Richmond and Virginia II were all still grounded right in front of the Federal batteries. As can be expected, the Union gunners opened up and started inflicting damage immediately. The Drewry suffered a direct hit to her magazine fired by a 100 lb Parrott located in Battery Parsons and blew up in spectacular fashion. Luckily for her crew they had been evacuated to the Richmond earlier in the morning as a precautionary measure. The explosion caused a shockwave to hit the nearby Richmond and Scorpion, disabling the latter vessel and causing her to float downstream to her capture. The 1st Connecticut Heavy Artillery, manning the guns in the land batteries, estimated a 50% hit rate from the 140 or so rounds they fired that morning into the target range presented to them on the morning of the 24th. “Special order from Lieutenant-General Grant, U. S. Army, regarding movements of the gunboats. City Point, Va., January 24, 1865. 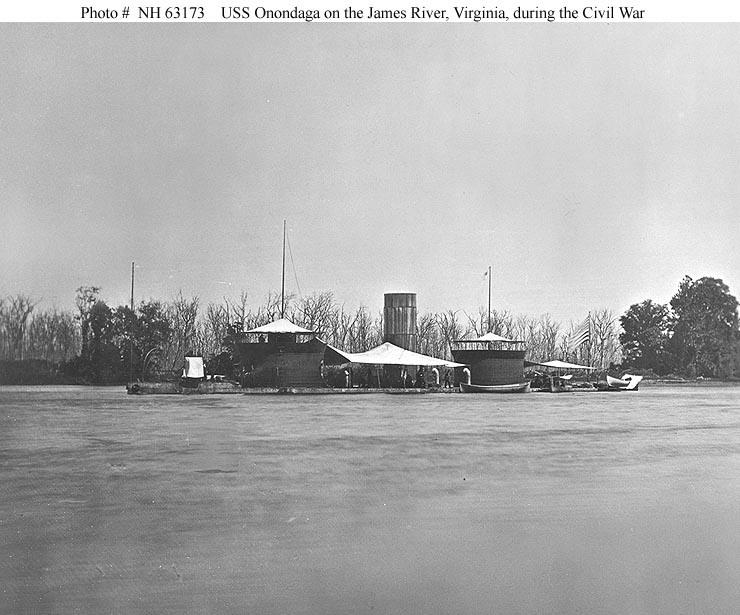 All gunboats now in the James River above City Point will immediately proceed to the front above the pontoon bridge, near Varina Landing. This order is imperative, the orders of any naval commanders to the contrary notwithstanding. Obviously Grant was taking no chances, perceiving Parker as useless and doing his utmost to save his stranglehold on Lee’s army, Richmond, and Petersburg. Before receiving this order, Parker had sent the torpedo boats Spuyten Duyvil and No. 4 in the direction of Trent’s Reach, but the Fredericksburg and Hampton had pulled back through the barrier by this point. More importantly, the massive Onondaga was on her way. I can find no reference to this accident in the Official Records, either army or navy. Did Commander Parker intend to attack the Rebels at dawn, as naval expert John Coski believes he should have done? Or was “Garryowen” mistaken in his understanding of the situation? Regardless, no matter the reason, Parker didn’t get up to the fight quickly enough for U. S. Grant, and he lost his job on the evening of the 24th as a result. Commodore William Radford came up and took over, with Parker disappearing from the war as so many others had before.